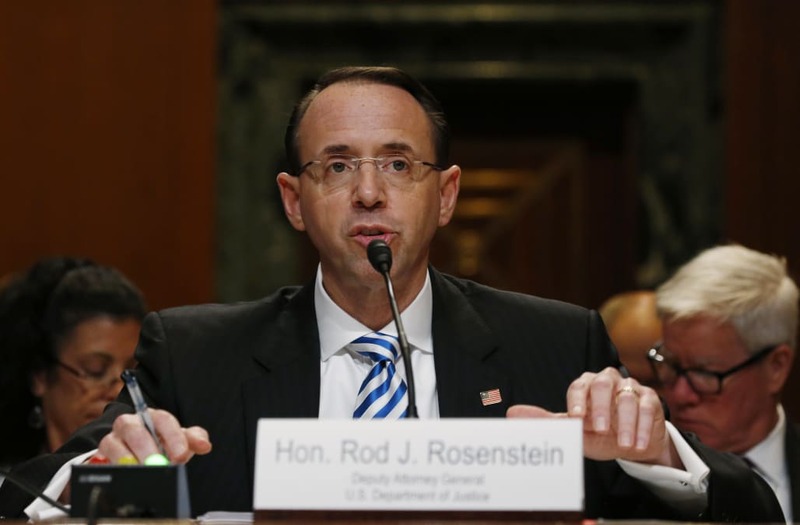 Deputy Attorney General Rod Rosenstein said on Sunday that the special counsel investigating Russia's interference in the 2016 election needs permission from the Department of Justice to expand his investigation if he finds evidence of an unrelated crime. In an interview with Fox News Sunday, Deputy Attorney General Rod Rosenstein said special counsel Robert Mueller's investigation of Russia's role in the 2016 campaign and President Donald Trump's campaign's potential ties to Russia was "not a fishing expedition." "If he finds evidence of a crime that is within the scope of what Director Mueller and I have agreed is the appropriate scope of this investigation, then he can," Rosenstein said. "If it's something outside that scope he needs to come to the acting attorney general, at this time me, for permission to expand his investigation." The deputy attorney general also pointed out that special counsel Kenneth Starr needed permission to expand his investigation during his probe into former President Bill Clinton's handling of a land deal. Top Trump administration officials have dismissed the investigation and attempted to undermine Mueller's credibility. Last week, White House special counselor Kellyanne Conway dubbed the investigation a "fishing expedition." But Mueller has broader authority in the investigation than the White House may realize. In appointing Mueller, Rosenstein gave him the authoritynot only to investigate "any links and/or coordination between the Russian government and individuals associated" with Trump's campaign, but also to examine "any matters that arose or may arise directly from the investigation." Rosenstein also gave Mueller the power to investigate "any other matters within the scope of 28 C.F.R. § 600.4(a)" — including perjury, obstruction of justice, destruction of evidence, and intimidation of witnesses. The mandate's scope is similar to that given by then-Acting Attorney General James Comeyto special counsel Patrick Fitzgeraldin 2003 to investigate who leaked the identity of former CIA operative Valerie Plame. Trump hasreportedly grown irritatedwith thefollow-the-money approachMueller has taken to the investigation. But it is easy to imagine why Trump's loans, debts, and business empire — which has benefited from money flowing out of Russia — would warrant Mueller's scrutiny as he tries to trace the origins of Russia's interest in the Trump campaign and determine whether Moscow holds any leverage over Trump or his associates. "If we got a report that Mueller was investigating, say, the Trump University fraud case, that would signal that this is a roaming investigation with an axe to grind," said Andy Wright, a constitutional law expert and professor at Savannah Law School. "But everything we've seen so far in terms of what Mueller is looking at has had a nexus to the Russia investigation."